Vegan, dairy-free, gluten-free, wheat-free, quick & easy. 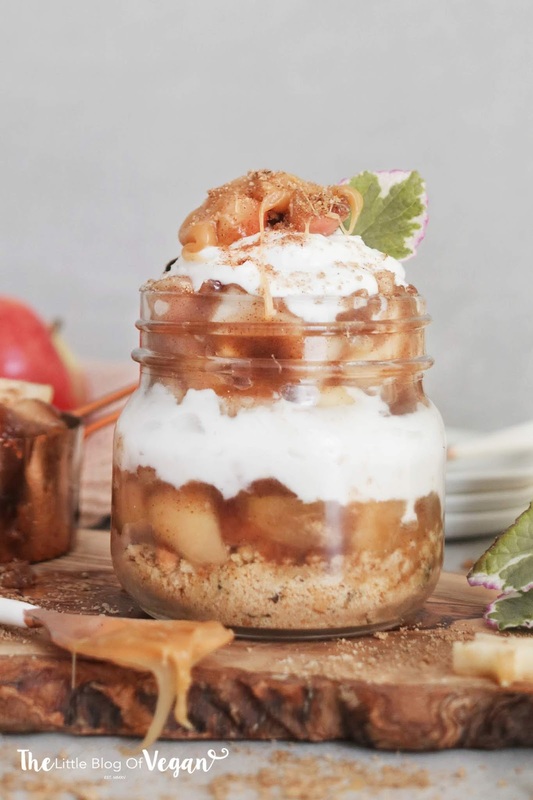 These caramel apple cheesecake jars scream Autumn to me! Fall time call's for apples, cinnamon, ginger, nutmeg, maple and all of those delicious flavours!. 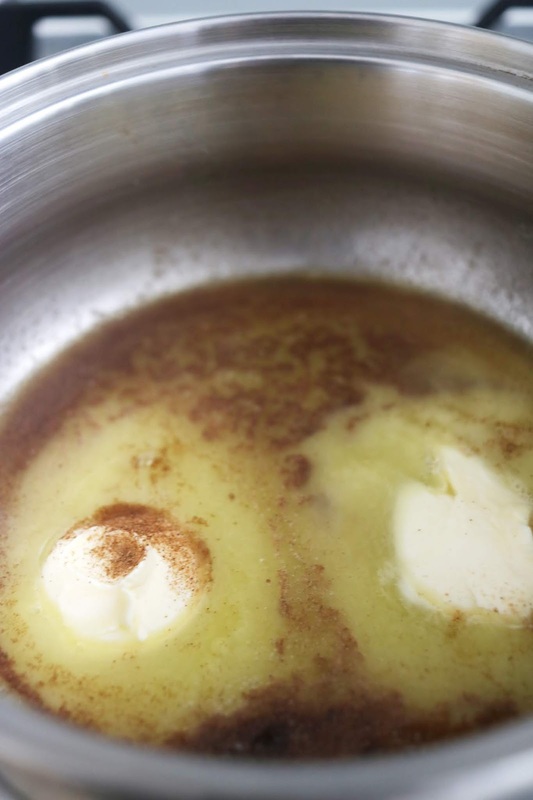 The caramel I used in this recipe is the Natures charm 'Butter Scotch Sauce'! 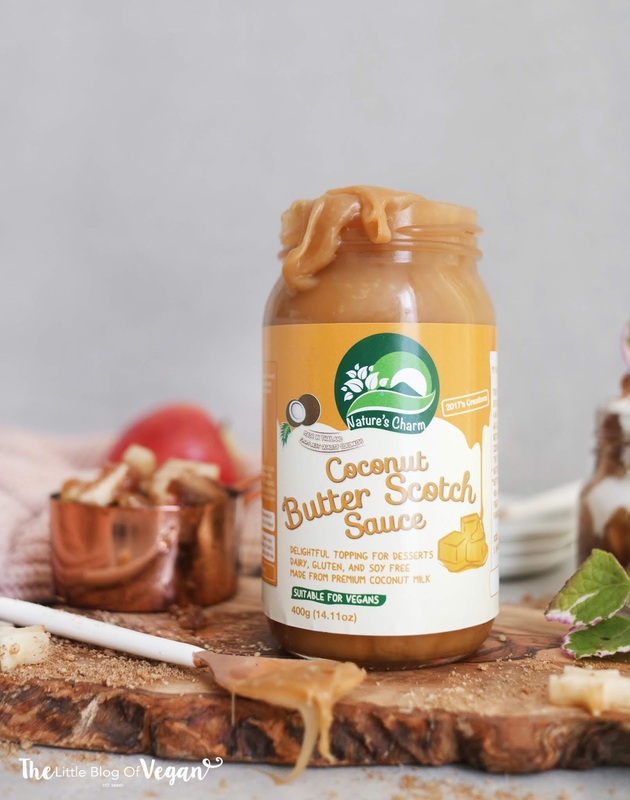 It's the perfect sauce & flavour to compliment the apple pie filling and silky smooth cream cheese! It gives sweetness, without being too sweet. 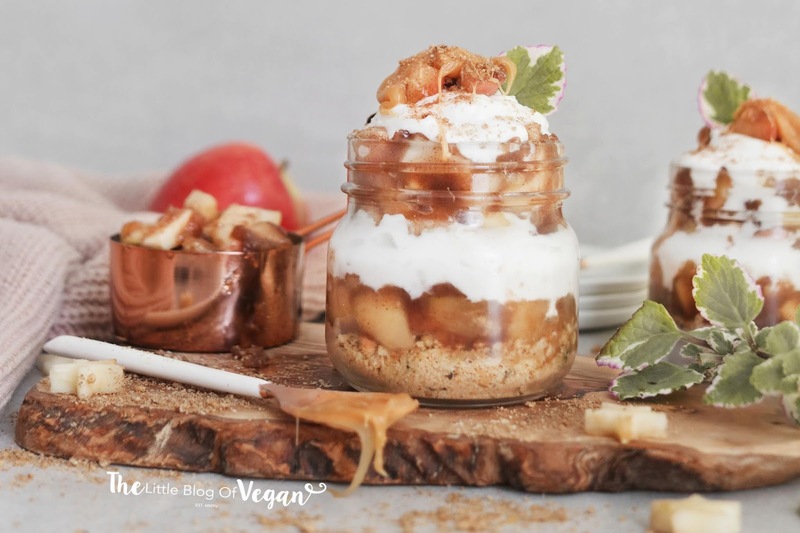 These caramel apple jars are quick & easy to make and would be perfect at dinner parties, special occasions or as a cosy dessert. Step 1- Core and chop the apples into small squares. Step 4- Add in a dash of cornstarch, the water and stir. 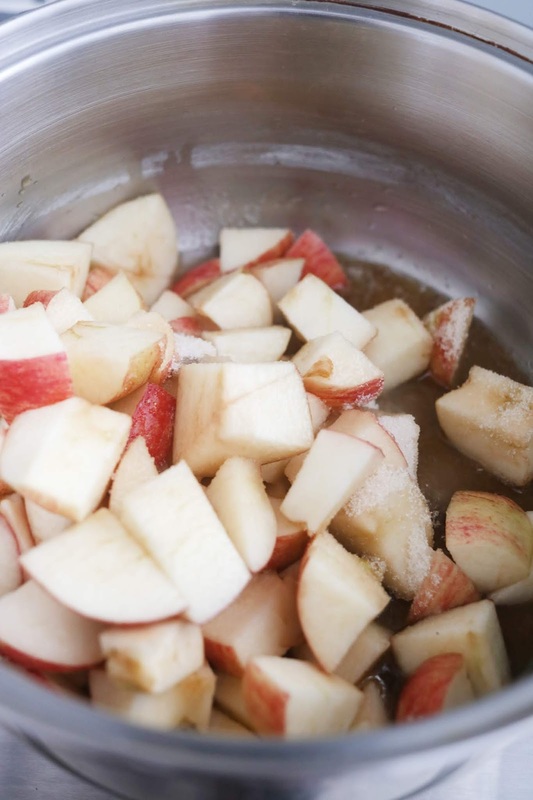 Allow the apples to cook for a few minutes until the sauce has thickened and the apples have softened, but aren't mushy. Step 1- Cream the coconut cream, cream cheese, vanilla extract and icing sugar on high speed until smooth. 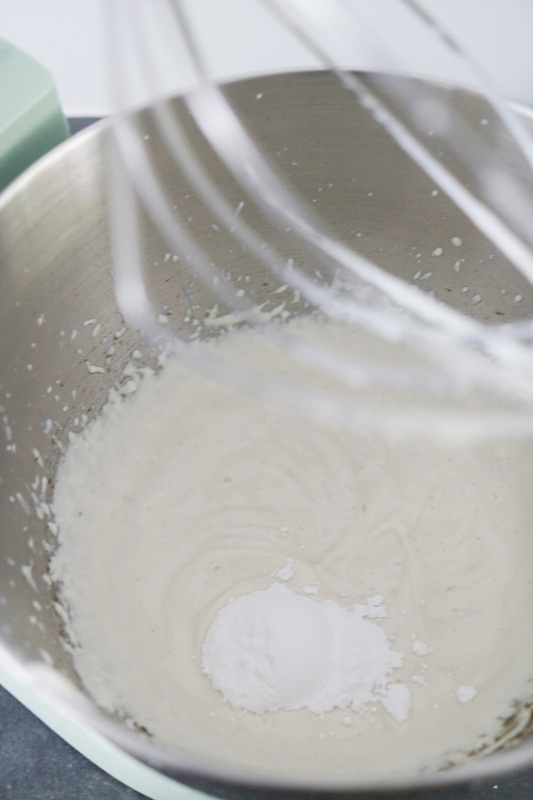 I used my Kitchenaid stand mixer with the balloon whisk attachment. Assemble the apple pie jars. Step 1- Place the biscuits into a food processor and whizz up until crumb-like. If you don't have a food processor, pop the biscuits in a bag and use a rolling pin to bash them until crumb-like. Divide between 3 mini mason jars and press down to compact at the base of the jars. Step 2- Spoon 2 tablespoons of apple pie filling on top of the biscuits, follow with 2 tablespoons of cream cheese filling, a drizzle of caramel sauce, then repeat a second time. Step 3- Top off with some apple pie chunks, a sprinkle of ground cinnamon and caramel sauce. Store in the fridge before serving. Best eaten fresh, day of making. These look sooooo good! Perfect dessert for hosting and I love how easy they are to make!